Three former secretaries of the Treasurylike their operatic counterparts the Three Tenorswere singing the same tune, a requiem for the U.S. political system. Three former secretaries of the Treasury — like their operatic counterparts the Three Tenors — were singing the same tune at a gathering in Beverly Hills, and it was not unlike Verdi’s requiem, only this time mourning the death of U.S. political cooperation. 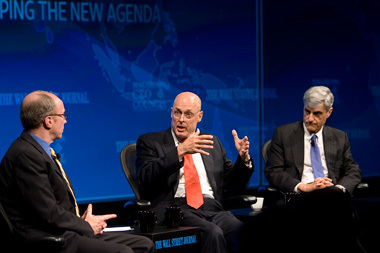 The Milken Institute Global Conference — a sort of West Coast version of Davos packed with political and economic policymakers but with arguably better weather than the Swiss original — treated its 3,500 attendees to a lunchtime conversation among Robert Rubin, Hank Paulson and Timothy Geithner. While one might expect three former Treasury secretaries spanning administrations of different parties — Clinton, Bush and Obama — to maintain spirited disagreement, the three men returned again and again to the same libretto. “The biggest risks to our relative position in the world are in Washington,” is how Geithner, the former Obama administration official, succinctly put in. “None of us knows about the future nor how economies perform in the short term, and we live in a messy, dark, scary, uncertain world … That is the normal fate of mankind, it’s sad to admit it … We have stark challenges, and our politics are terrible,” he said, adding that Americans are fortunate to face fewer problems than any other major economy. Nevertheless, all three top-ranking decision makers lamented that American leaders are failing to face those problems. “The world is changing quicker than our policies are changing,” and the U.S. needs fundamental changes in tax policy as well as entitlement reform. But needed changes are not on the immediate horizon. Rubin cited “a totally dysfunctional Congress” and disengaged public. And specifically with respect to entitlement reform, the cumulative, long-term nature of the problem is at odds with contemporary governance. “Our system is sort of famously good in extremis, but not so good for slow-burning issues,” Geithner added. All three former secretaries repeated, in almost schizoid fashion, how much better off the U.S. was than other countries — “I agree with Tim; we have less challenges than any major country,” Paulson said. But he neutered the remark by saying that only “fundamental changes” can address today’s economic problems of slow growth, income disparity and technology’s displacement of human labor. Rubin underscored this point, telling moderator and Facebook COO Sheryl Sandberg that her tech industry is “highly labor displacing in terms of jobs,” and opining that true unemployment is higher than official figures suggest. Sandberg quoted Arvind Subramanian, the chief economic advisor to the government of India, telling a gathering of officials at an IMF meeting in Washington earlier this year that bitter political division in the U.S. is tantamount to “handing over legitimacy to the rising powers,” withdrawing U.S. economic power while at the same time not effectively sharing it. To Geithner, the contraction of U.S. world economic leadership signals a “profound erosion of support in both parties for the types of institutions globally that were so essential to the prosperity of the U.S.” in the postwar world. In this context, he and his colleagues despaired of weakened support for free trade. The former secretaries hit on other issues as well, such as China, the main area of Paulson’s current work with the Chicago-based think tank The Paulson Institute, which promotes bilateral cooperation. “China has emerged as a formidable competitor, as well as partner. The relationship with China is by far our most important bilateral relationship. There are many areas where we have shared interests,” he said, citing climate change, economic growth and global stability. Sandberg, author of “Lean In,” asked the panelists what could be done to boost female participation in corporate America. “Hire more women, promote more women, pay them more fairly; it can’t be rocket science,” said Geithner, currently president of private equity firm Warburg Pincus. Paulson thought CEOs needed to “push from the top down” to boost female participation. Rubin, now co-chairman of the Council on Foreign Relations, said he would take the risk of not sounding politically correct by observing that over his career he has seen relatively equal numbers of men and women in professional positions at the entry level. Returning to their familiar chorus, however, all three tenors, or Treasury secretaries, echoed one another in responding to Sandberg’s question about today’s biggest economic threat: “Ourselves” was their response. — Check out Tony Blair, Lindsey Graham: Wake Up! 21st Century War Is Here on ThinkAdvisor.